Order for 33 G-BKF recovery cranes and 38 G-LTM 1090-4.2 mobile cranes. Particular focus on passenger protection – all the cranes feature armoured cabins. The deliveries are due to start in the second half of 2018 and be completed by 2021. The order comprises the delivery of 33 armoured recovery cranes with model name G-BKF and 38 G-LTM 1090-4.2 mobile cranes. These are 90-tonne class telescopic cranes which also feature armoured driver’s cabins and armoured crane cabins. The deliveries are due to start in the second half of next year and be completed by 2021. The G-LTM 1090-4.2 ordered by the German Army is a four-axle mobile crane derived from the standard LTM 1090-4.2 version with an armoured driver’s cabin and an armoured crane cabin. It has a 35.7 metre telescopic boom and a recovery winch at the rear. 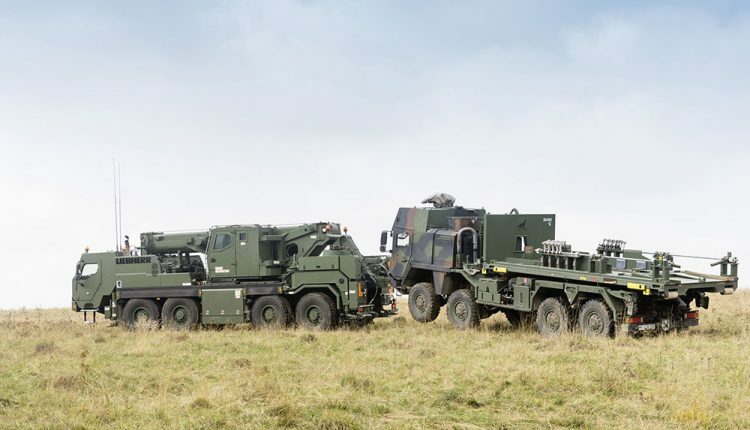 The order from the German Army involves 17 G-LTM 1090-4.2 cranes with 8.4 tonnes of counterweight known as “Heavy duty mobile cranes” and 21 units of the same model with 22.5 tonnes of counterweight with the designation “Very heavy duty mobile cranes”. The order also includes container systems for transporting crane equipment. The focus when the order was placed was on the protection of passengers. To meet the high requirements in this respect, Liebherr-Werk Ehingen GmbH worked with Rheinmetall, the leading European supplier of military equipment, on the armoured driver’s cabins and armoured crane cabins. The driver’s cabins protect the crew from ballistic, mine and IED threats and also feature an NBC ventilation system. The superstructure cabins protect the crane driver from ballistic threats during crane operations. The two cabins are identical for the G-LTM and G-BKF vehicles.